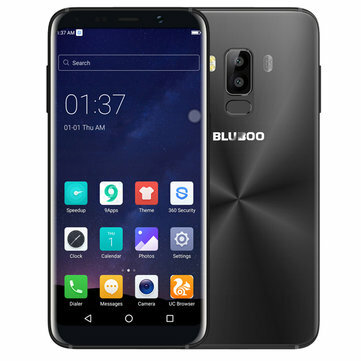 The Bluboo mobile has launched Bluboo S8 bezel-less infinity display like as Galaxy S8 and S8+ 5.7” Dual Rear Cameras Android 7.0 3GB RAM 32GB ROM MTK6750T Octa-Core flagship phone available at a special pre-sale price of $149.99 on official. The Bluboo S8 phone is the latest smartphone to arrive from Bluboo official and one which looks to offer features as same look likes of the Samsung Galaxy S8. Although, the difference being that the Bluboo S8 is more affordable smartphone designed as bezel-less infinity display, but . For those new to this smartphone, here is a brief overview of the main features on offer with the Bluboo S8. Bluboo S8 features a 5.7-inch Sharp HD+ infinity display, which is 18:9 aspect ratio. Inside, the S8 comes loaded with 3GB RAM, 32GB internal storage, and is powered by a MediaTek 6750T octa-core processor. On the camera side of things, the BLUBOO S8 comes loaded with a dual rear camera setup, spearheaded by a 16-megapixel rear camera, and backed up by a 3-megapixel secondary camera and 8MP front- facing camera while additional features include expandable storage up to 256GB, a Zn-Ti alloy metal frame, USB Type-C connectivity, a 3,450 mAh fast charge-supported battery, and 360 OS. BLUBOO S8 is packed with 3450mAh battery, 4.4v battery care and fast charge which ensure more working time between charges, Bluboo S8 in hand never mind battery dies. Presale Price in : US $149.99 , UK at £118.42 Australia for AU$195.52 in GBP £118.42 and Canada CA$195.61 official available on banggood.com.